Call for entries has begun to the 2018 Philo Festival Of Media Arts video competition; June 1-30, 2018 via Film Freeway. To view rules, categories and more click the FilmFreeway Button below. Philo Festival of Media Arts proudly accepts entries via FilmFreeway.com, the world’s best online submission platform. Click here to submit your videos with Film Freeway. 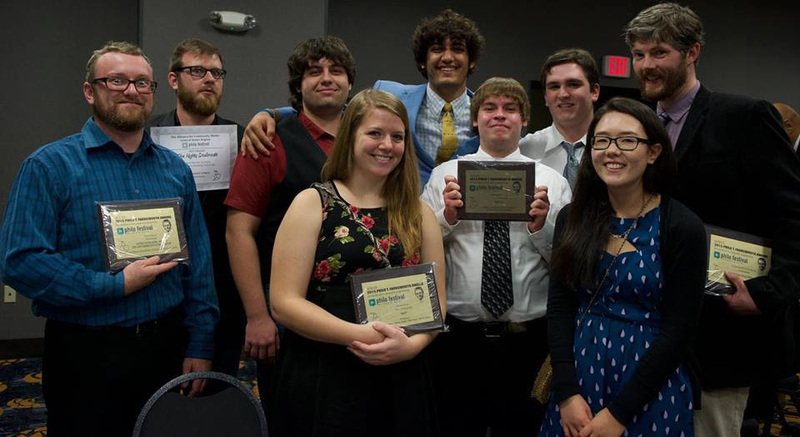 The 2018 Philo Festival of Media Arts Award Ceremony will be in Alliance, OH on Saturday, October 27, 2018. Submission for the 2018! Congratulations to all the 2017 Excellence Winners!! The Award Ceremony video is on YouTube; click here to view it. You can also download the ceremony for your channel. Click here for the SD google drive link. Or here for the HD google drive link. And view photos from the event by clicking here. The festival is named after Philo T. Farnsworth, the father of modern television. Philo was born August 19, 1906 on a farm near Beaver City, Utah. As a youth in 1922, Philo first revealed his scientific ideas for an all-electric television system. He later established an electronics laboratory in Fort Wayne, Indiana, where he succeeded in turning his dreams into reality by inventing the first receiving tube for television transmissions. It is fitting that the ACM Central States Region honors the memory of Philo T. Farnsworth by recognizing the efforts of modern day pioneers who work to further develop the use of this technology and promote the use of media in our communities. The “PHILO” is awarded as recognition of excellence in media creation. The Philo Festival of Media Arts is all about you: the media producer. It’s a unique combination of competition, collaboration, educational and creative content hosted by the Central States Alliance for Community Media. The event offers invaluable networking opportunities and immersion into the creative art and the rapidly evolving world of independent media. The festival features professional speakers, creative minds, and notable mentors that are there to help you tackle the latest media making trends and technology. And of course…the awards will be given to honor and celebrate your amazing work. Congratulations to all the 2017 Philo Festival of Media Arts Winners & Finalists! We hope to see you in 2018 for next year’s award ceremony! Ann Arbor, Mich. and Grand Rapids, Mich. – The Sustainable Resources Alliance (SRA) and Spalted Banjo Consulting (SBC) are determined to spread the word about the benefits that forestry can provide for Michigan’s landowners, even in the more urban parts of the state. Two new videos from this partnership, Active Forest Management: Protecting Michigan’s Forests for the Future and Urban Wood in Michigan connect viewers with the value of trees, both while they are living and once they are dead. The video series was produced as a capstone for Spalted Banjo Consulting’s recent wood harvest and utilization demonstration project with the Land Conservancy of West Michigan (LCWM). Supported by SRA via a USDA Forest Service grant, SBC used traditional forestry techniques to assist restoration activities on two of the Land Conservancy’s properties. At Brower Lake Nature Preserve, the team removed low-quality pine trees that were hampering the site’s biodiversity and potentially endangering recreational trail ways. At The Highlands, hazardous dead ash trees were removed from the converted golf course. At both sites, wood from the removed trees was recovered and milled, which is not a typical practice on conservation properties. By producing pine fence posts and ash lumber as a byproduct of their restoration activities, the LCWM was able to extend its resource conservation ethic even further. Both videos are available for public viewing on the website of the Michigan Urban Wood Network: http://miurbanwoodnetwork.com/more. Spalted Banjo Consulting (http://spaltedbanjo.com) is a natural resource and small business consulting company with a mission of helping landowners, nonprofits, municipalities, and other organizations with effective and sustainable resource management. MPACT Government Access @ Monroe City Hall: 120 E. First St.
And more! Exact information TBA. We’ll also stop for a lunch break and have a round table Tip or Trick discussion on what your station has done to make their production work easier. Thank you to MPACT & the City of Monroe for hosting the 2018 tour! More information TBA! Each year, Michigan NATOA and Michigan ACM collaborate to bring together sessions as part of the MAB Conference. In return, our members receive a huge discount for attending. Caroline Beasley, Beasley Media Inc.
9:50 am: Innovation Break featuring LiveU, Inc. The past few years has seen an increase in discussion over diversity in media. Are the stories being told in your community being accurately represented? Media helps construct the perception in which we live. What happens when media omits or distorts a whole group of people? In this session we explore race, gender and other social issues and how we can better represent diversity. Cable cord cutting is one of the biggest scares community media centers have when it comes to sustaining funds to keep centers operational. There are several ways money can be raised to contribute financially for organizations but what about grants? First, how do you find them and second, how do you write an award winning grant? This session will help media centers learn grant writing techniques and help navigate where to find sources of revenue. The social world is becoming ever more present in our everyday lives. Stories are at our finger tips. We no longer have to wait for the 6 O’Clock News or wait for a monthly subscription to come out; it’s instantaneous. Not everyone uses media in the same manner, nor is captured by it. By using mixed media, you’re reaching a more diverse and wider audience who can help share their story. With cable cord cutting become ever more relevant, it is now more important than ever to capture your audience and their story through social. In this session you will learn how to engage community members through various digital techniques. An increasing number of facilities and news organizations are doing more with less; yet demand is ever increasing. How can you meet the multiple platform demands at our fingertips while staying relevant and keeping communities informed? In this season, you will learn 101 ways to repurpose content; including a handout showing how easy it is to share one story 101 different ways using one tool.